Ahead of the holidays, consumer safety group World Against Toys Causing Harm (WATCH) has issued its annual list of the most dangerous toys. WATCH says the 10 toys on this year’s list may be dangerous to children for a number of reasons. Fidget spinners, for instance, contain small parts that can be a choking hazard, while Mattel’s Wonder Woman sword has the potential to cause blunt-force injuries. However, the same common hazards that were found in past years -- like inadequate warnings on toy labels, small and pointed parts, and projectile pieces -- are present in many of the toys on this year’s list. As more consumers do their holiday shopping online, WATCH argues that it’s more important than ever for shoppers to have the most current information about the safety of toys they’re considering for purchase. The group urges parents and caregivers to take precautions when buying toys during holiday shopping, which accounts for 65% of all annual toy sales. WATCH pointed out that there have been at least 15 recalls representing nearly 2 million units of dangerous toys since December. Hallmark “Itty Bittys” Baby Stacking Toy. Despite being recalled by the CPSC in August 2017, this toy is still on the market. The agency found that the toys’ fabric hats and bows can detach and pose a choking hazard. Pull Along Polly. This toy was deemed unsafe due to its 19-inch long cord, which could present a strangulation hazard. Industry safety standards require strings on playpen and crib toys to be less than 12 inches long. Wonder Woman Battle Action Sword. The rigid plastic sword blade may cause facial or other injuries, WATCH says. Hand Fidgetz Spinners. As we’ve reported, some fidget spinners can contain high levels of lead while others can overheat while charging. 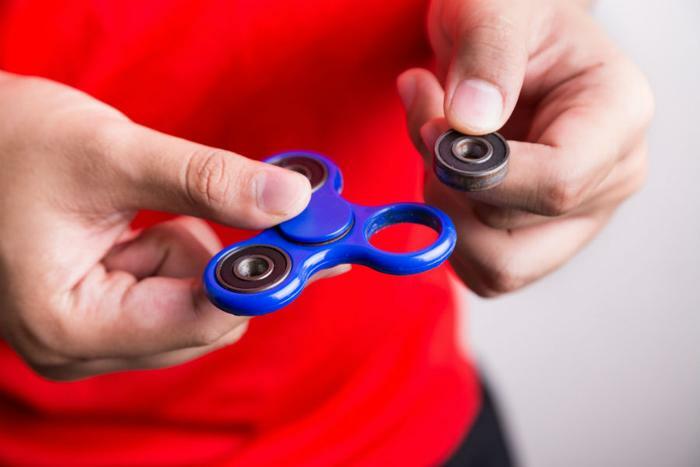 But despite being sold as a “novelty gift item” that is “not intended to be used as a toy,” WATCH found that this spinner is still sold in retail toy aisles and remains popular among children of all ages. Spider-Man Spider-Drone Official Movie Edition. This toy launches a drone into the air via rotating rotor blades, which could cause injury. Nerf Zombie Strike Deadbolt Crossbow. The force of the arrows launched from the crossbow could pose a risk of eye or facial injuries, WATCH says. Slackers Slackline Classic Series Kit. Although marketed for children of all ages, its label warns of the potential for “severe injury or even death” with use due to its potential of strangulation and fall-related injuries. Oval Xylophone. The 9.5-inch long drumstick handle on this instrument, which is marketed to babies as young as 12 months, could potentially block a small child’s airway. Jetts Heel Wheels. These rear-wheel roller skate shoes feature “real sparking” action, which set off red flags for WATCH because of the burn risk. Brianna Baby Doll. WATCH warns that the removable clothing and pink ponytail holders on this doll, marketed to kids ages 18 months and older, could be a choking hazard. While WATCH’s annual list of dangerous toys is intended to keep kids safe, toymakers argue that the list is “needlessly frightening” to parents. “Each year these allegations do not stand up to scrutiny when reviewed by the U.S. Consumer Product Safety Commission,” Joan Lawrence, SVP Standards & Regulatory Affairs for the Toy Association, told ConsumerAffairs. “By law, all toys sold in the United States must meet 100+ rigorous safety tests and standards and be certified compliant by a federally approved testing lab before being offered for sale,” she said, adding that W.A.T.C.H. does not test the toys in its report to check their safety. But W.A.T.C.H. says existing toy safety standards are inadequate. “The fact that unsafe toys that are poorly designed, manufactured and marketed are still reaching toy store shelves and can be found for sale online is proof of the inadequacy of existing safety standards,” Joan Siff, president of W.A.T.C.H. told ConsumerAffairs.